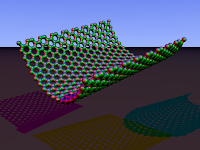 Molecules of carbon keep showing more and more promise for future use in electronics. This week scientists in South Korea demonstrated a process to make a transparent and flexible computer chip out of many interlinked carbon atoms. The days when we can wear our computers and keep the screens folded up in our pockets seems to keep getting closer and closer. When carbon atoms are organized into a honey-comb patterned molecular structure they exhibit all kinds of exciting properties. They are great electrical conductors and are very structurally strong while still lightweight. When you roll them up into a cylinder, they're called carbon nano-tubes, and could possibly be used in everything from a space elevator to micro-circuts. If you keep the carbon honeycomb in flat sheets, it's known as graphene, and it's showing a tremendous amount of potential as the computer chip material of the future. The team in South Korea was able to efficiently make these flexible nano-sheets by first evaporating a carbon rich substance over a sheet of nickel. When the gas condensed back to a solid, a honey-comb lattice of carbon atoms formed on the surface of the nickel, efficiently creating graphene. The nickel sheet is then dissolved away with chemicals and the graphene is stuck to more flexible plastic sheet. By etching specific patterns onto the nickel sheet, the circuitry paths needed for creating a working processor forms when the carbon condenses. This is a huge step forward for the creation of nano-computing. Though the method still needs some refining, this method is far more efficient than previous techniques for creating large scale sheets of graphene. Once purer graphene can be produced in greater quantities, technicians think that these chips could be the key to building exponentially faster processors. This is very good news, because a recent simulation shows that just linking more processor cores together will eventually reach its limit of efficiency, and actually start to slow down computer processing. This new technique using graphene could be the key to continue to push processing speeds ever faster for years to come. Top 5 Discoveries of LAST WEEK!!! Sometimes Even Scientists Have to Just Say "Huh?" What in the Heck is "Quantum Computing" Anyways? What Do Broomsticks and Rockets have in Common?